Some more on day one from Bike Auckland. And from the same site, a look at the opening of the Alford Street bridge. Coincidentally, as you were taking your photos Russell, I was driving our Bus through The Tunnel. I have a more than slight tunnel and bridge phobia...so Peter, as The Navigator, tries to desensitize me by plotting journeys so they encompass as many of these structures as possible. So, Friday we did the Waterveiw....and either I'm in recovery, or this is an especially well designed piece of infrastructure. The lanes were well wide enough and the tunnel well lit. The slight curve and incline thing was quite cool. I'm not overly convinced that we had a quicker journey from SH16 to the Southern MWay but it was a different and not altogether unpleasant experience. One day we may find parking so we can spend a while checking out the wheelchair accessibility of the Topsides. Oh, the "feathery" things....they are (rather nasty) spikes to prevent ijits from climbing up and over the bridge....I think. So, Friday we did the Waterveiw….and either I’m in recovery, or this is an especially well designed piece of infrastructure. And, unfashionable as it might be to say so, the Waterview Connection is doing its job of taking traffic off local roads. That might not last, but it's very welcome for now. Hell yeah! Mt Albert road is significantly quieter now. Quiet enough even to consider a proper cycle path on it even?? We also spent Sunday riding all over these paths. Absolutely love the new bridges and love they way they are all different - they almost become art pieces on the landscape. We (I) goofed riding east and ended up on the old footpath which follows the creek and isn't really wide enough to use as a cycle path but it meant we got to ride under Alford bridge before we circled around to ride over it. All the new paths are exactly what you want, wide and smooth and the occasional stripes of coloured concrete just add to the feel these these are meant to be enjoyed rather than simply used. And there were lots of folks out enjoying them on Sunday, meanderers like us, kids on trikes rolling down the little hills, walkers, runners and families out exploring. It felt great. I fear the chicanes are there to stop load bikes and people with trailers. They look inconvenient, but with my quad bike they'd be just about impossible. Quad and trailer is expressly designed to let me sit a 2.4x1.2m sheet of plywood on top of it, so it you can't readily get something like that through a barrier it's going to mean I have to stop, unload, portage everything across, then reload and continue. This is not, IMO, unreasonable - part of the joy of decent bike paths is that it lets you load up your bike trailer or loadbike with a book shelf, chest of drawers or whatever rather than being forced to use a powered mobility aid. Oh and did you notice how the handrails on the bridges are at bike height! That's a very low balustrade, on the bridge that crosses the exposed motorway! Agree with everything you’ve said Russell. Went along on Sunday with the family – very impressive. Two small gripes – the blue bridge has some unpainted steel which I think detrimentally affects its look and the brown/orange stain on the concrete by the motorway can be rubbed off with fingers. I’m looking forward to the northern side of New North Road opening. I’ve jumped the fences and run along the unfinished path (and bridge) over the past few weeks and it is going to be very cool. 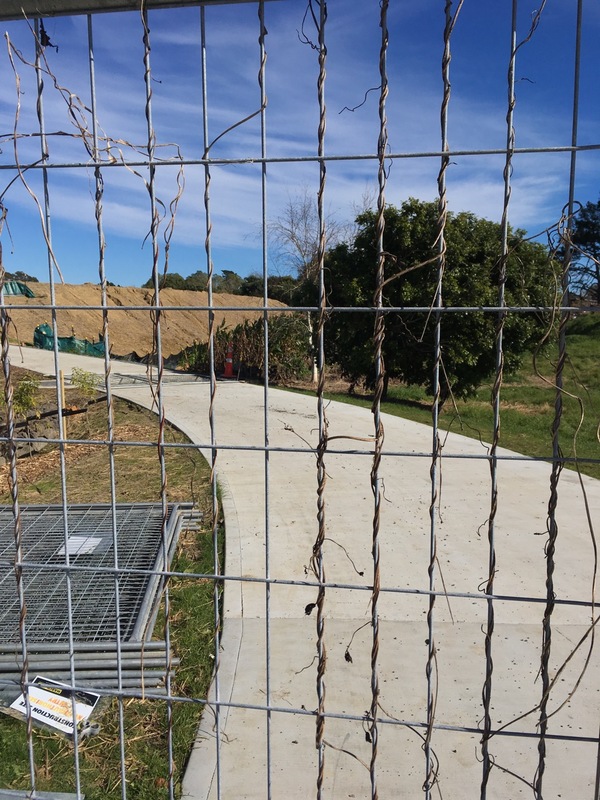 For runners, the existing Oakley creek walkway (past the waterfall) is perfectly serviceable and avoids the traffic and fumes on Great North Road. That’s a very low balustrade, on the bridge that crosses the exposed motorway! Yeah,interesting point – especially when you look at what was done over the Pink Path, with its high perspex walls. I'm glad though – it's nice to be able to see over the rails. The “feathers” detail I would suspect is a “this’ll stop the buggers climbing up here” feature…. that or a variant on the anti bird installations you see all over the show in Wellington CBD. I guess that might be the case – but it would be impossible to climb on the arch anyway. Not the first time this bridge had become a pathway for two wheelers. Way back, in the post war era, an old friend was horrified when neighbours informed her that Number Two Son, all of eight years old, had 'ridden the humps' on his bike whilst mum was at work. Don't know, sorry. I do know that the connecting paths from Point Chev are due to open soon – which might be the point at which I get my partner on a bike. Couple of side streets, one major road to cross and then it's safe all the way to Mangere Bridge. Nowadays down here in Chchch we know a thing or two about infrastructure, it is no longer infra dig to the masses. coupled with disaster capitalism and ‘people-who-know-best’. and this which local MP and Regeneration Minister read as being positive. and this – none of the ‘experts’ factored in a piece of road that had traditionally flooded having sunk a further 50cm – which they faithfully recreated! and we’ve got one of those ‘swoopy air things’ now too! Its name hasn’t settled down yet – it’s been called Memorial Arches and Memorial Gateway – it seems to not be a ‘Memorial’ to anything in particular just referencing that it creates a gate (or arch) to Memorial Ave (which is a memorial to air servicemen and women who lost their lives in the Second World War ) which is a missed opportunity methinks. The painted steel arch is purely sculptural, and intended to welcome and impress visitors to a city recovering its vibrancy after the devastation of the 2010-2011 earthquakes. At night the arch will be illuminated by $500,000 worth of creatively designed lighting. "The structure is set to become a powerful symbol for Christchurch. It will leave a lasting impression on locals and travellers alike and it is exciting to see it in place,” Transport Minister Simon Bridges said. The arches, designed by Warren and Mahoney, symbolised the crossing of paths, the Southern Alps, the braided rivers of the Canterbury Plains, and the excitement of travel. Bridges said having the arches finished was a good indication the entire highway project was on track. I love the bit that outlines all the things it ‘symbolises’ (we get a lot of that down here these days) and also the tenuous nature of Minister Bridges’ forward planning nous. but it would be impossible to climb on the arch anyway. Oh I dunno, 'Impossible' is a red rag to some - some kind of electromagnetic or suction glove and knee pad arrangement might be worth a crack - or even something strong and porous that could use the spikes as anchors and cushion them from the climber... gloves and shoes made from old mattresses? ...not that I want to give anyone any ideas. But when ya think about all the things that used to be 'impossible' I wouldn't be holding my breath. Is that right (all the way to Mangere Bridge)? I hadn’t realised you could get that far. That is quite something. Yep. It stops for a few crossings along the way, but it's traffic-free. Well, almost. Taking the cheap option a few years ago with the stretch from Hillsborough Road leaves some of it on a quiet road. But the big problem there, as I noted in the post, is the punishing climb to Hillsborough heading north – on a heavy chip surface. Must bring my bike up this weekend and go for a spin. I told a story when I was chatting with Jesse M on Bookmarks last week, about the crushing rejection of my bid to join a local social cycling group because I have an ebike. Said it felt a bit like when Dylan went electric (smiles)! rejection of my bid to join a local social cycling group because I have an ebike ... "when Dylan went electric (s"
ebikes on social rides shouldn't be an issue I would have thought. Even some of the competitive kids are riding them these days, not least so the less fit ones can keep up.